After battling cancer last year, a beloved Area 6 bus driver has been chosen as this year’s Relay for Life honorary survivor. The first time Kim Cannon heard the word cancer was on March 20, 2015. It was a Friday. Cannon and her husband, Rick Moore, were at the doctor’s office. Moore had discovered what he thought was a swollen gland on his neck, but the antibiotics he had been prescribed had done nothing to reduce the swelling. In fact, the lump was getting bigger. But it wasn’t a swollen gland, as doctors later told the couple. It was squamous cell carcinoma — cancer. And it was stage three. One year later, Cannon can still recite all the milestones of her husband’s treatment process. March 30: Moore went in for his needle biopsy. He faced complications and bled out, leading to a four-day hospital stay. If the cancer was in his blood, it could spread to his entire neck. April 7: Moore recovered from the bleed out. The mass lump was removed from his neck. April 8: Plant City’s Relay for Life 2015. Though he had been released from surgery just hours before, Moore insisted on attending the overnight event. Moore and Cannon’s friend of over 20 years, Linda Herman, was that year’s Relay for Life leader. This year, Moore will attend the Relay for Life event again. But he’s not going as a cancer patient. He’s going as this year’s honorary survivor. When he was diagnosed, Moore was working as a bus driver for Area 6 schools. Because Cannon and Herman both work in the school system, Moore frequently volunteered at school events, especially at Knights Griffin Elementary, where Herman is a teacher. 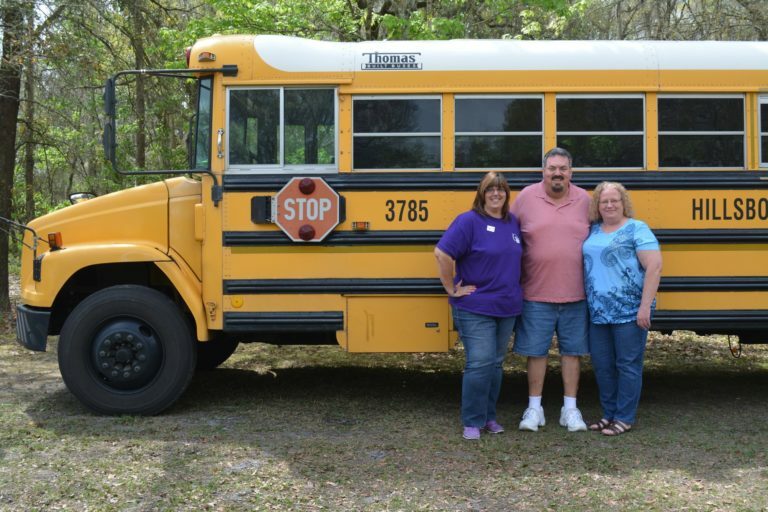 His willingness to help whenever needed and his close relationship with the students who rode his bus made him beloved in the Hillsborough County school system. His dedication, Herman said, was one of the main reasons that he was selected as this year’s honorary survivor. Moore is back on his bus route now, but he had to stop working temporarily when he went through radiation treatments and chemotherapy last year. Moore’s absence was noticed, both on his bus route and at Knights Griffin Elementary. As he began treatment, teachers and fellow bus drivers began donating their sick time hours to Moore, so that he would continue to be paid while he was out of work. By the time he finished treatment, Moore had over 200 hours of sick time given to him. And he needed it — Moore went through chemotherapy once a week and had radiation five days a week. His son, Tyler, drove him to the Center for Cancer Care and Research at Watson Clinic for his treatments.While he received radiation, Moore would lie down with a plastic, porous mask over his face. He wasn’t allowed to move his head. Receiving radiation wasn’t tough for Moore. He jokes that he can fall asleep instantly. Still, he faced the side effects of the treatment. After some of his hair started falling out, he shaved his head. He had nausea, bouts of depression and loss of appetite. For a long time, the only foods he could stand to eat were baked chicken, eggs and fish. It wasn’t just eating that made him sick. The smell of food, even microwaved food from the other end of the house, made him feel ill. Cannon and the rest of Moore’s family frequently ate at restaurants or got takeout to avoid making Moore sick. But the doctors, and Moore’s support system, helped. He was put on radiation treatments that made him less nauseated. Family and friends, including Cannon and Herman, kept him in good spirits. Before his chemotherapy treatment every week, Herman would make him a goodie bag full of everything he might need: t-shirts, good luck charms, blankets, gum and his favorite snack, circus peanuts. The goodie bags came in handy during chemotherapy treatments. Moore and Cannon brought treats for the nurses on his chemotherapy days. Feb. 24, 2016: The first day in almost a year that Cannon could write off as a happy date. And just in time for Relay for Life 2016. On the tough days, Relay Honorary Survivor Rick Moore looked to his mother. She had battled cancer in her late 70s, in early 2013, and beaten it. She recently celebrated her 80th birthday. Now, Moore plans on supporting others who are facing his same battle. At the 2016 Relay for Life, which will be held from Friday, April 8, to Saturday, April 9, Moore will make a speech and take a victory lap. Area 6 bus drivers and one for Knights Griffin Elementary. Cannon said that the biggest difference she’s seen in her husband is his positive attitude. Though he’s always been a jokester and kept everyone laughing, he is now in positive spirits. As always, there’s no guarantee that Moore will forever be cancer-free. But for now, he’s enjoying the little things: his wife, his friends, his family and getting back on his bus.